There is a product called Honey Nut that is Turkish and incomparable. First of all, look at it. 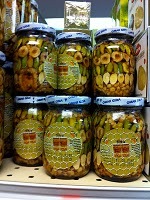 It’s a jar lined with artfully arranged nuts, packed tight in honey. It is so much fun to look at it! And while I’ve never been the greatest fan of honey — to my palate, it tastes flowery in an often unwelcome way — this is wonderful: in addition to the pistachios, hazelnuts, almonds, and walnuts, there are some powerful aromatics in there which temper the overall effect: black cumin, apricot seed. I don’t know if this is Turkish code for honey, but it lists bee milk and bee pollen as ingredients. I think there is coconut in there, too. It’s fragrant, healthy, protein rich, crunchy, sweet, but also slightly complex, due to the unusual stuff in there. Furthermore, it’s pleasing in a sort of geological way, because different strata actually taste different. If you live in Brooklyn, it’s available at King’s County Candy and Nut on Newkirk Plaza, in addition to the Eastern Market on Coney Island Avenue between Aves H and I.
It’s also in my pantry, but it’s going fast. Is there anything at all that I do not like about Honey Nut? Is there anything at all that I do not like about your blog?